We grew up in the Seacoast area, close to Dover NH. 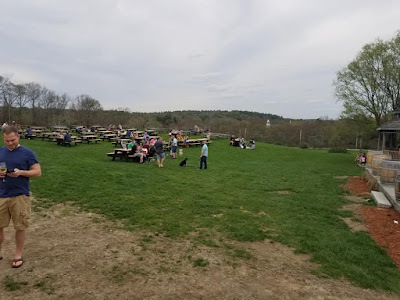 So when we got word of the Seacoast Microbrew Festival, we had to go. We bought tickets for $35 for the second session, which was from 6-9. That $35 bought us a really cute tasting glass and unlimited tastings. The festival was very organized and well set up. 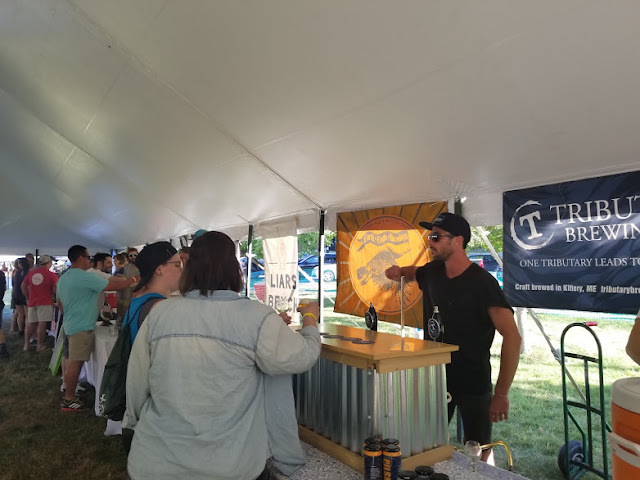 There were two large tents that each had breweries running adjacent to one of the sides. There were about 20 breweries, all from the Seacoast area. 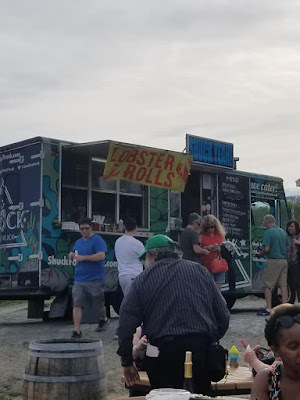 There were also two food trucks, an oyster stand and another food stand. There was a live band playing. What we were most impressed with is that they capped ticket sales so it wasn't overcrowded. I didn't have to wait behind more than one or two people in any line. 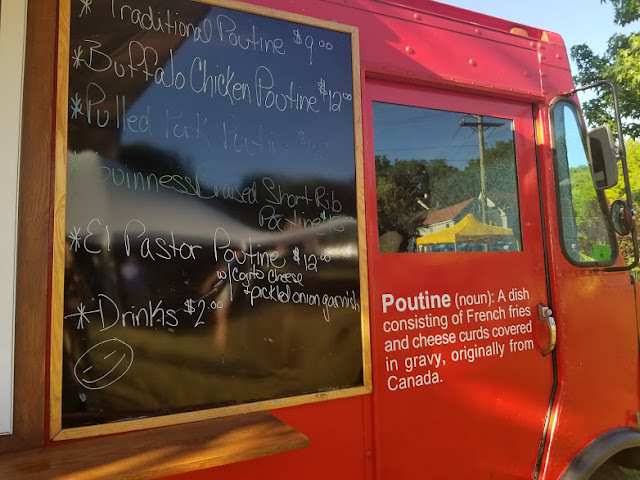 For food, I decided to the poutine from The Poutine Co food truck. I got the classic which came with just fries, cheese curds and gravy. It was delicious. Derek even went back for a side of fries! Okay, now let's talk beer. 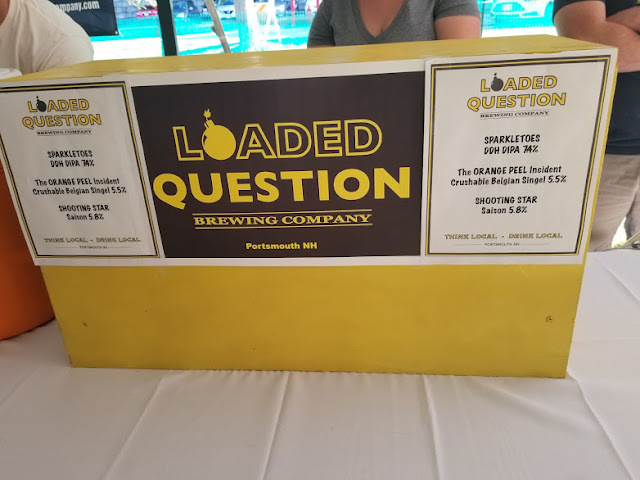 Loaded Question Brewing Company's Shooting star Saison: I rated this beer a 3/5 noting that it was nice and crisp and a good summer drinking beer. 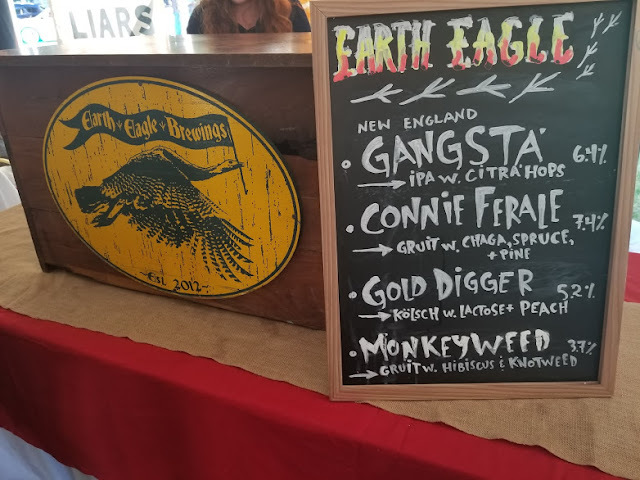 Earth Eagle Brewings' Monkey Weed: I really liked this beer and gave it a 4/5. It was fruity and I got some grapefruit hints in it. I would love to get my hands on this beer again. 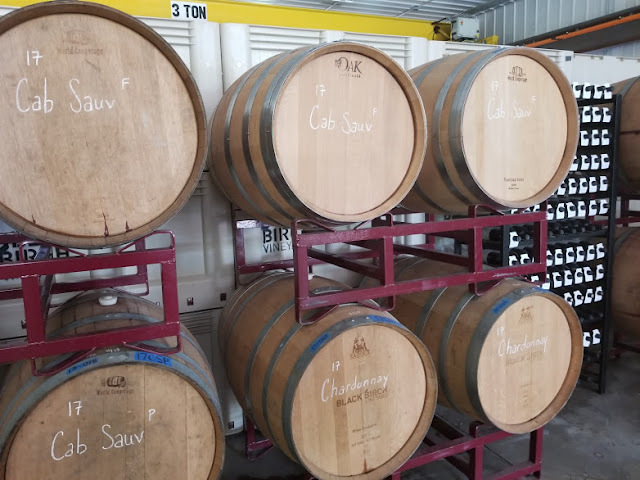 Tributary Brewing Company's Beir de Meil. I gave this one a 3/5. It was pretty complex. I noted some caramel and banana notes in it. Chapel + Main's Tropical Dependence: I noted that this one was crisp with hints of lemongrass. I gave it a 3/5. North Country Hard Cider's Fire Starter. This was one of my favorite sips of the night. I gave this cider a 5/5. I noted that it tasted like Christmas, cinnamon and fruity. The pomegranate was balanced well. I usually don't go for ciders at brewfests, but this one was intriguing. Pineapple Thunder: I gave this one a 3/5. This cider was more sweet and had a strong tropical taste. The cilantro was mild. Garrison City Beerwork's Spindrift: This Gose was another favorite. I gave it a 4/5. The balance of lemon and salt was perfect! I love a good Gose, and would love to drink more of this. SoMe Brewing Co's Nubble Weisse: This was my favorite beer of the night. This Berliner Weiss tasted of strawberry and banana. I gave it a 5/5. Stoneface Brewing's Berliner Weiss Raspberry: I love their stuff every time we go to their brewery. I gave this one a 3/5 noting it was sweet and very razz. Throwback Brewery's Rhubarb Wit: I gave this one a 3/5. I noted that it was very mild with the Rhubarb flavor. It was a nice, crisp summer sipper. Portsmouth Brewery's Passion Fruit Sour: Another favorite. I rated it 5/5. This one made the tongue tingle. The Passion fruit flavor was a punch in the mouth. Woodland Farm Brewery's Ruby Slippers Berliner Weiss Raspberry: I loved this one too! I gave it a 5/5. I noted that it was nice and crisp, and tastes of fresh raspberries. Beara Brewing Co's Outer Limits: This was the only Double IPA I tried. I liked it and gave it a 4/5. I noted that there was no skunky after taste. It was nice and sweet. Neighborhood Beer Co's Bronze: my first Bronze beer. I gave it a 4/5 noting that it was malty. Bad Lab Beer Co's Trillion Lights Wit: I gave this one a 3/5 noting that it was crisp and tasted like summer. Great Rhythm Brewing Company's Squeeze and Tropical IPA: Derek gave these two beers a 4/5. He said they were both really drinkable and flavorful and had no bitterness. Deciduous Brewing Company's IPA: he gave this one a 4/5. There was a good hop profile and you were able to taste each of the different hops without being too hoppy. While at the festival we were also able to meet up with our friend Don from the Brew Bus. We got to hear about the new tours being offered. We are going to sign up for one hopefully this year! We also played Trivia by spinning the trivia wheel and won! It was fun. We for some cute koozies to bring home.Brew Bus is in Maine, Massachusetts and Rhode Island. All in all, this was a great festival and we will be back. 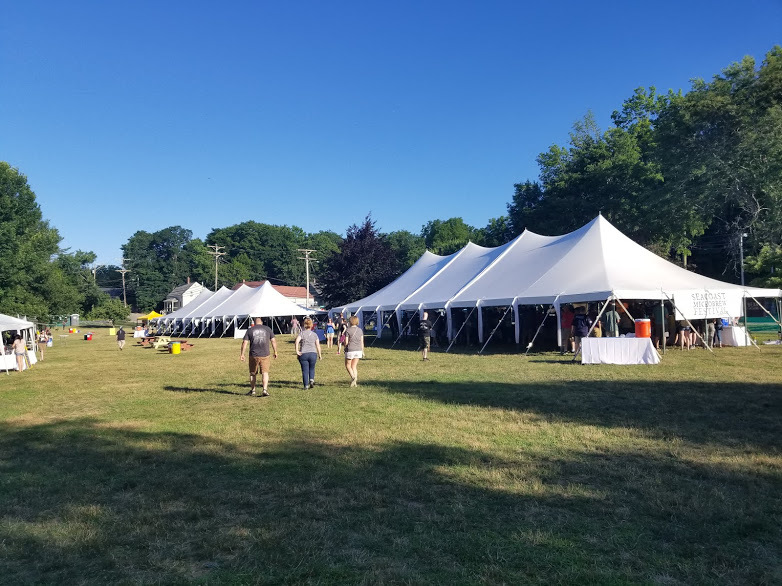 Great beer, a well organized venue and good food created a pretty great event. New England just went through MAJOR heat wave last week. It happened to also coincide with my one week vacation. 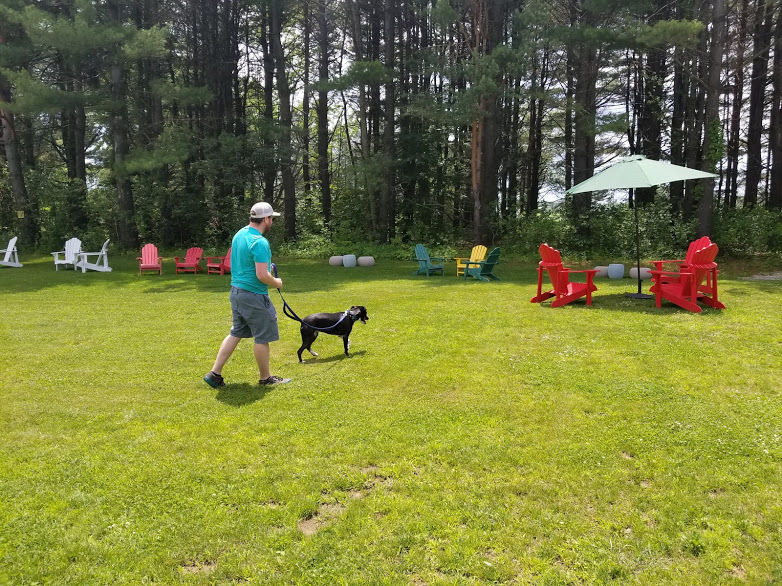 The original plan was to take the weekend off and take Eleanor, our 11 month lab mix rescue on a couple hikes and maybe a brewery or winery or two. Well... heat indexes over 100 degrees put a stop to the plan, and we had to improvise with something else. 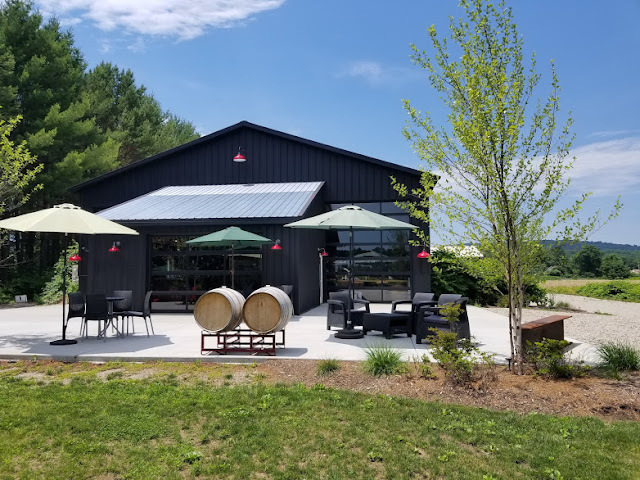 The first stop was Black Birch Vineyard in Hatfield, MA. 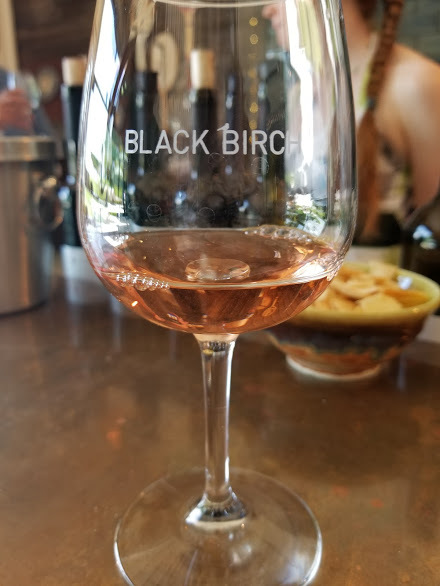 Black Birch is uniquely set on a back dirt road out in a residential area. The building has a very vintage meets modern look. Outside, there was a large front lawn with Adirondack chairs. 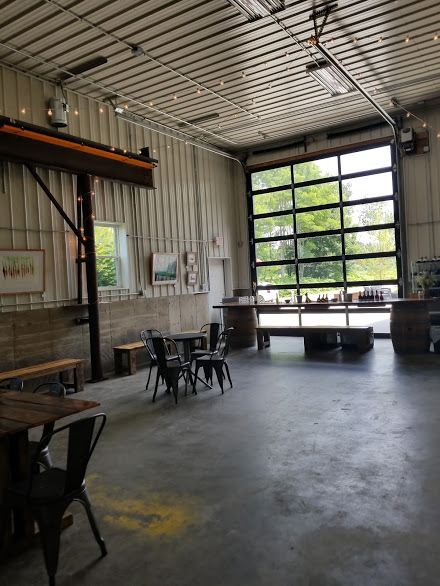 Inside, there was a nice size tasting room, and then a larger space for people to sit and enjoy bottles. All in comfortable A/C. 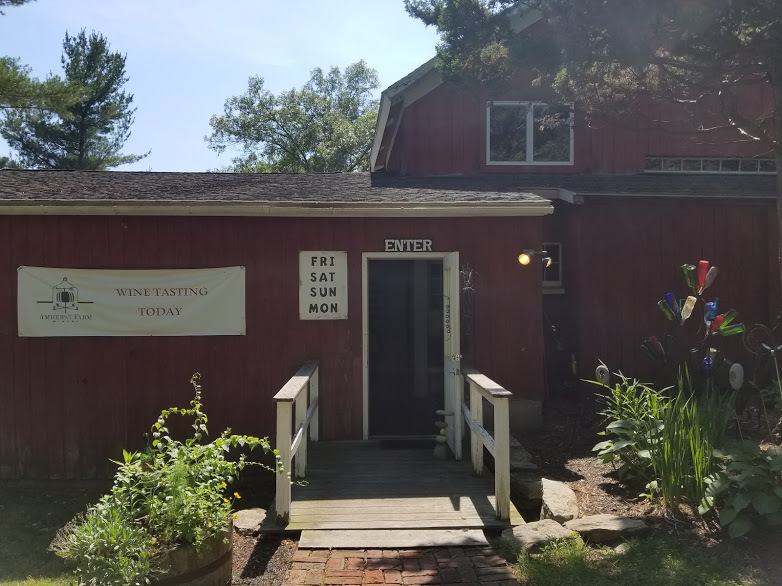 We took up spots at the bar and spoke with a couple of different employees who were all friendly and knowledgeable about the wine. 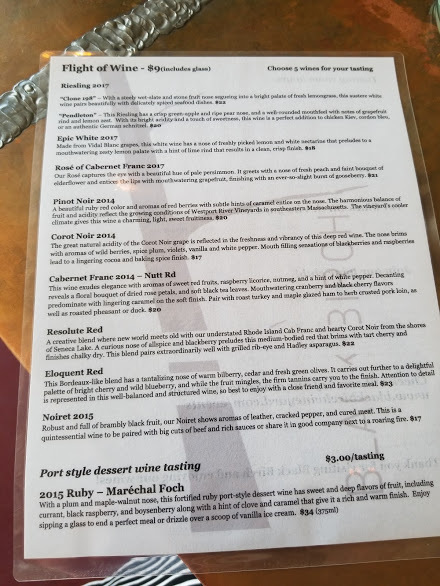 We each bought a tasting, which included the two wine glasses. Cabernet Franc 2014- Nutt Rd: really good! That's all he had for this one. Also, the best part, they have a winery dog! Eleanor got to play with the pup a little bit. It was great for her to get the interaction as it was the only pup she saw that day. The second winery of the day was Amherst Farm Winery in Amherst, MA. This winery had a nice laid back feel, and was a little more crunchy, earthy. 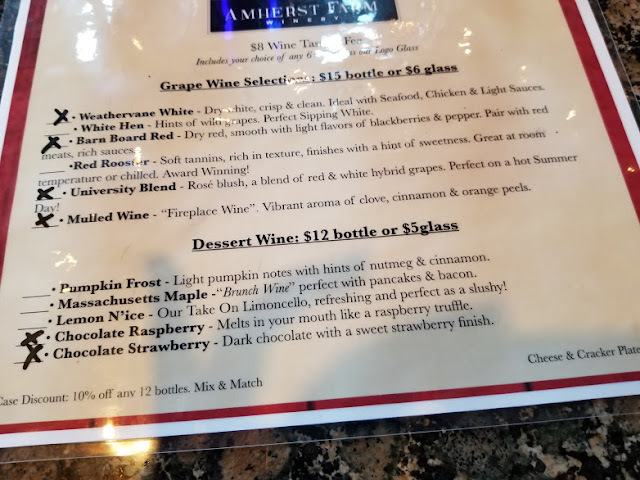 There were quite a few fruit wines on the tasting menu, but we didn't get into those. I do have some regret over not trying the blueberry though, because I heard the people next to us raving about it. We were greeted there with open arms. Eleanor was welcomed also, by name! 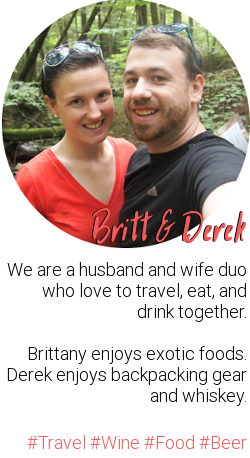 Derek had told the winery our dog's name when he asked through Facebook about dogs, and they remembered her! So, it made for a nice personable experience. This winery had a nice big space inside with a large tasting bar. Eleanor stood at the bar, and we were quickly offered water for her. They were cool with us treating her and letting her drink water. Derek and I got a tasting each, again glasses included, and tried a lot of the same wines at this spot. Mulled Wine: tastes like a cocktail, almost like an old fashioned. Cloves, orange, very easy to drink. Lemon N'ice: tastes just like lemonade. Suggestion was to enjoy as a slushy. Chocolate Strawberry: very good, light, slightly fruity. 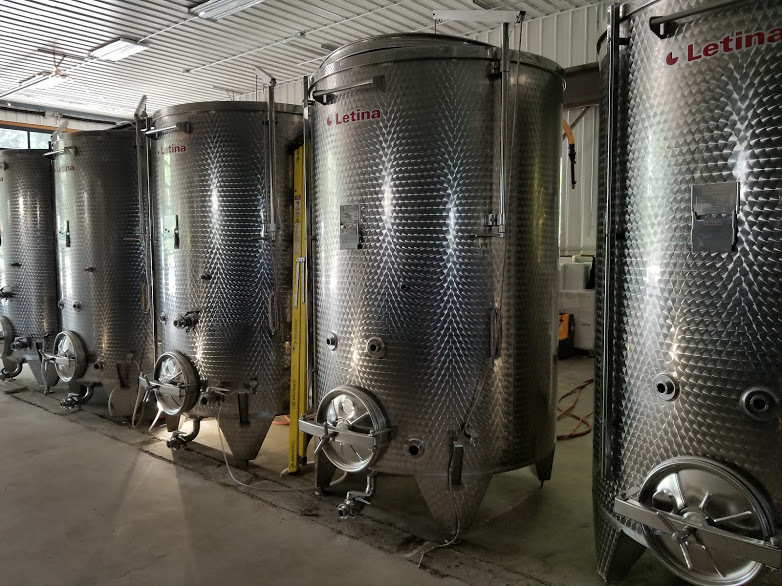 The final stop of the day was Hardwick Winery. Eleanor was a little tired at this point, so this was a quick stop for us. 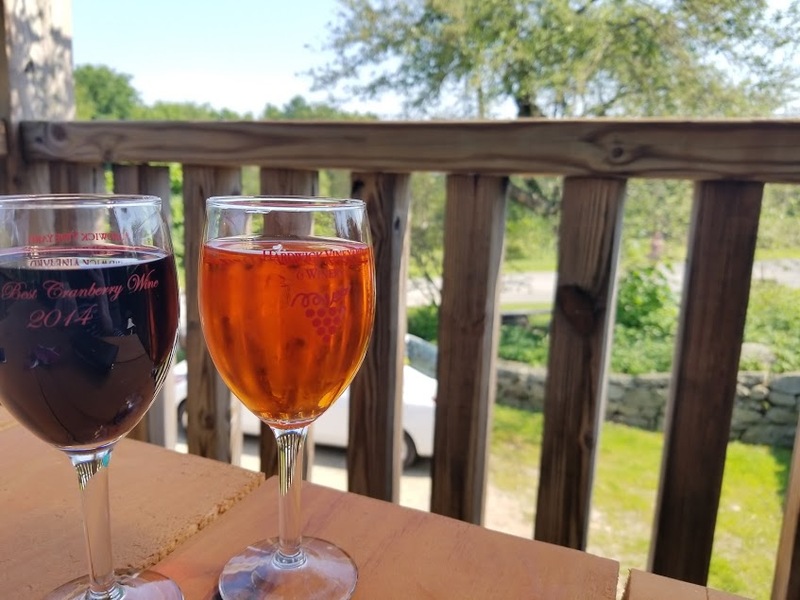 We decided to grab a glass of wine each and sit on the deck, which had a nice breeze and some shade for the pup. Eleanor was able to just lay down and relax in the corner, so it was a nice, chill spot for her. I sipped on the Yankee Girl Blush, which was tart and cherry forward according to my tasting notes. 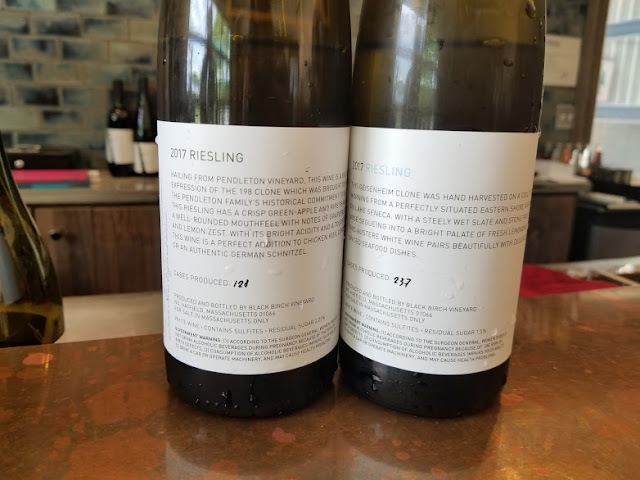 It also had some nice melon notes. Derek had the Hardwick Red, which had a lot of plum. We are excited to explore more dog friendly wineries, breweries, distilleries and restaurants. Let us know if you have any suggestions for us! We would love to hear them. On Father's Day this year, we went to the Seacoast Food Truck and Craft Beer Festival in Somersworth, NH. 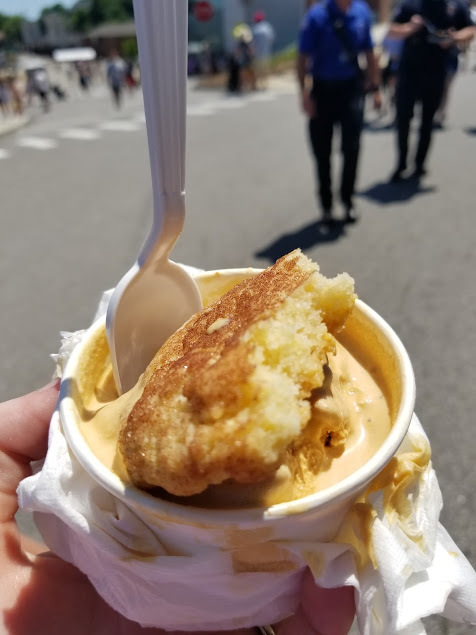 It was put on my the Food Truck Festivals of America. We didn't get to go to the first one last year, so we were excited to try it out this year. We got a beautiful day for it! The event was very well organized. We were able to get in quickly with our prepaid tickets, which cost $5. It was $10 at the door. 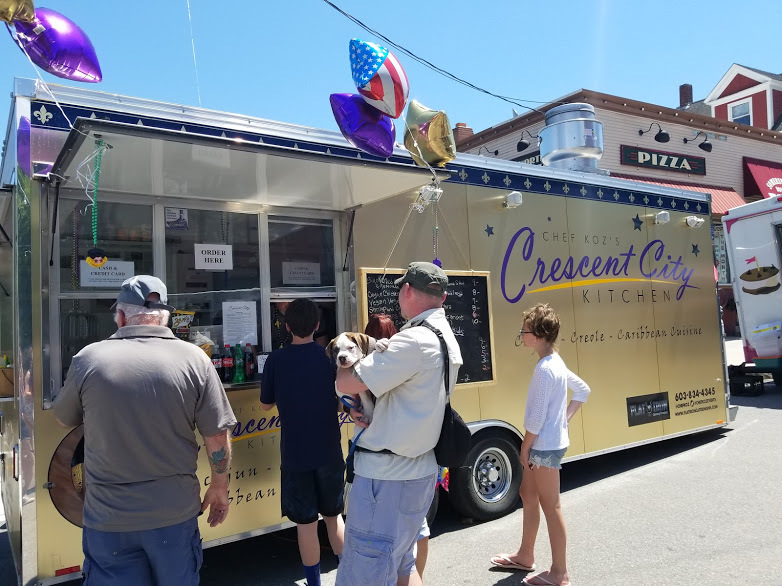 All the food trucks were spread out in downtown Somersworth, so there was plenty of room to walk around. 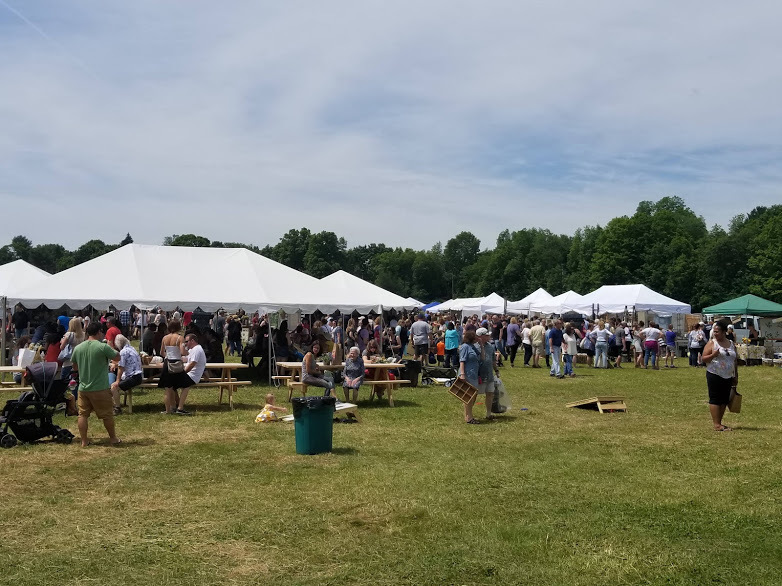 The beer tents were all organized together, making it easy to see all the options when grabbing a cold one. One thing that we were impressed by is how short the lines for food were and how fast we got to order and get food. 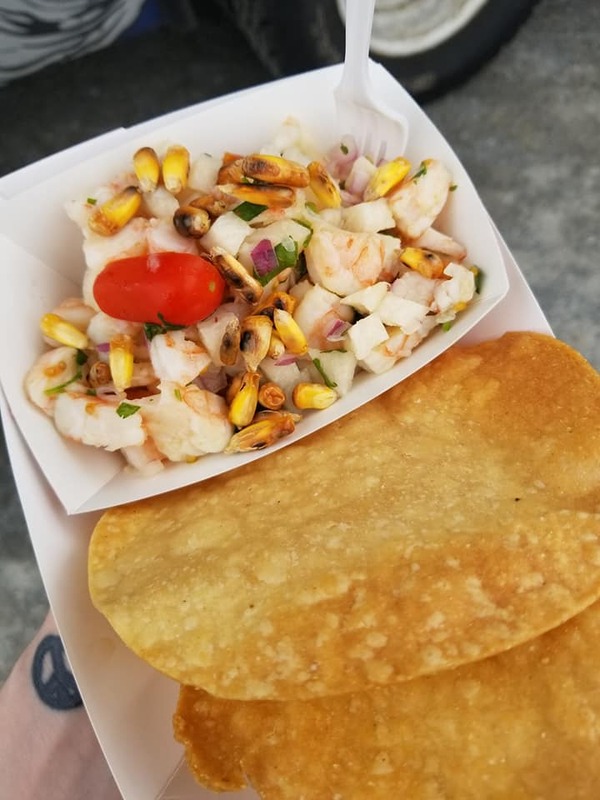 Usually at these festivals, you wait in line for 30 minutes to an hour to get food! I don't think we waited more that 5 minutes at any truck. It was hands down the most well organized and smoothly running food truck festival I gave been too. Let's talk about the beer first! We each bought 2 beer tickets (I later went back for a third) for $6 each. 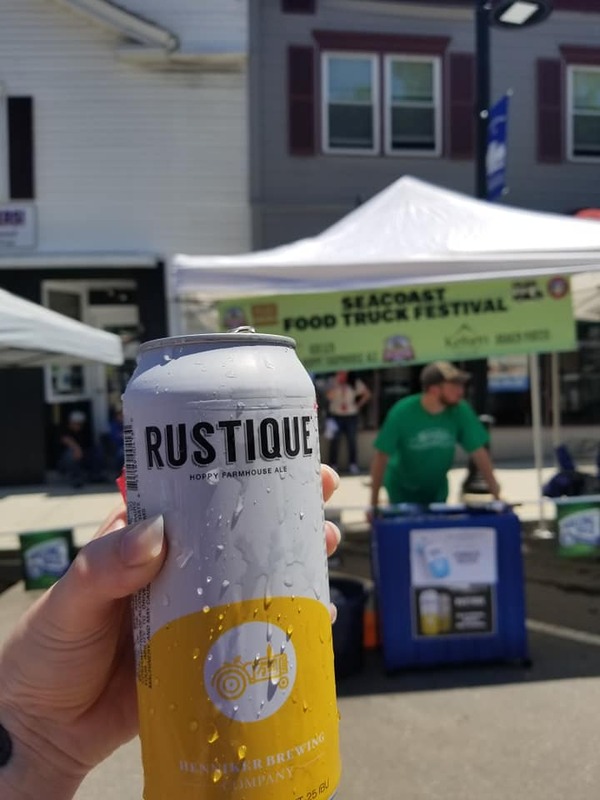 I started off with Rustique Hoppy Farmhouse Ale by Henniker Brewing Company. It was crisp and refreshing on a hot day. It wasn't too hoppy, which was good because I don't like the after taste in anything too hoppy. I was pleased with my choice. Derek started with a Summer Session from Peak Organic Brewing Company, which he said nice and refreshing for a hot day. 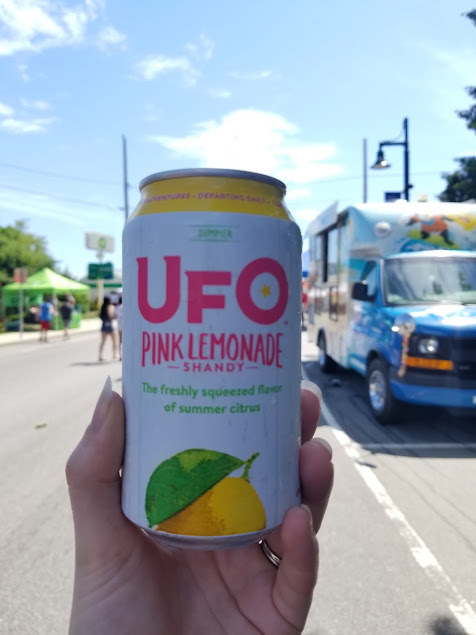 We both tried the Pink Lemonade Shandy by UFO Beers. This will be a summer favorite of mine. This beer was amazingly refreshing. I loved the lemonade taste that wasn't too sweet. It also wasn't too sour. I need to find this one in stores. Now let's talk about the food! 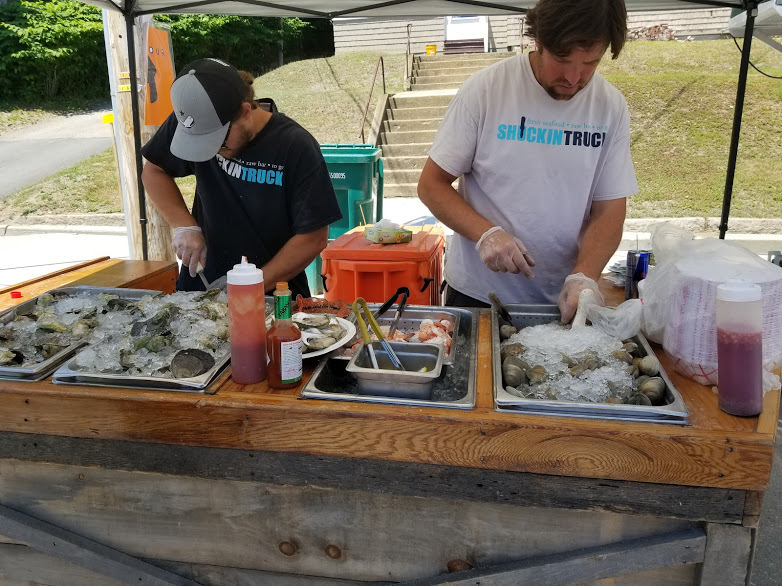 I started off with some raw oysters at Shuckin Truck. They had a great deal, 3 for $5. The oysters were HUGE! They were Briney and sweet. 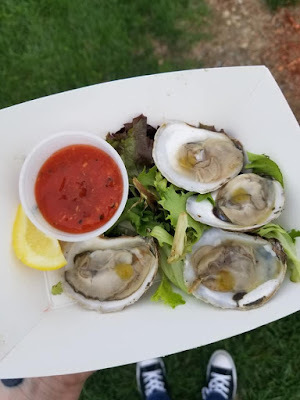 I loved that they were shucking them right out in the open under a tent too! Next, I needed something with a little more substance. I found a truck called Chef Koz's Crescent City Kitchen. This truck specializes in Cajun, Creole, and Caribbean food. I ordered the Cajun Shrimp Taco. 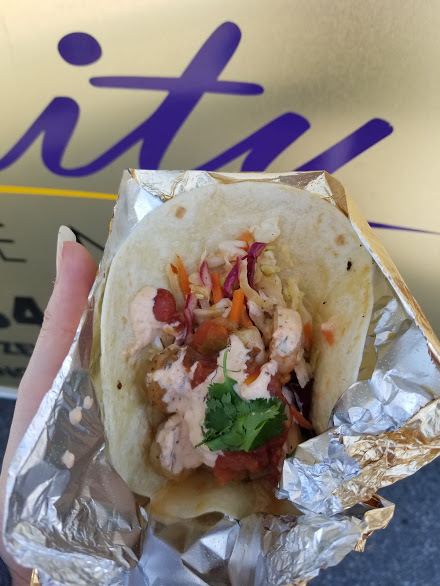 The taco cost $9, but it was well worth the cost. The shrimp was succulent and had the perfect amount of spice. I loved the sauces, and the juices were just dripping from each bite. It was honestly one of the better tacos I have had. Derek started off with a bowl of French fries from Kody's. They were traditional fair fries, which we always look forward to at fair season. 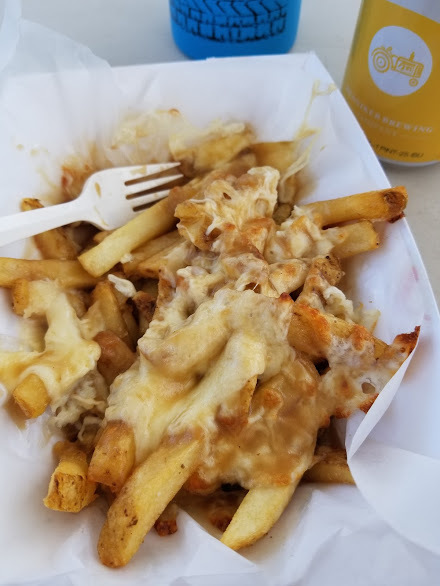 I was in a fry mood too, so I went to the Melt food truck and ordered the traditional Poutine. 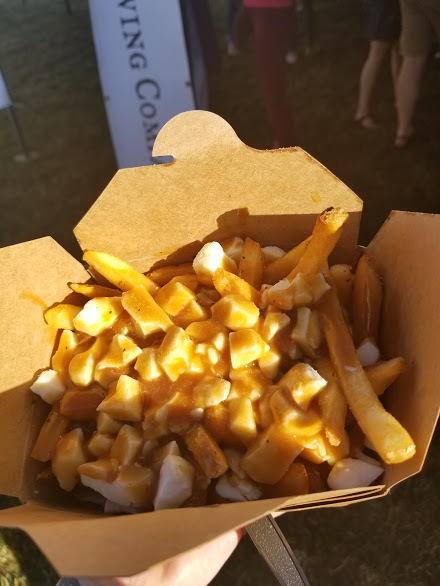 This was the best poutine I have had. The gravy was delicious, sweet and flavor forward. The cheese curds were melted on top, which I wasn't too sure about at first, but I liked it better than just sprinkling the cheese curds. It was time for dessert next. 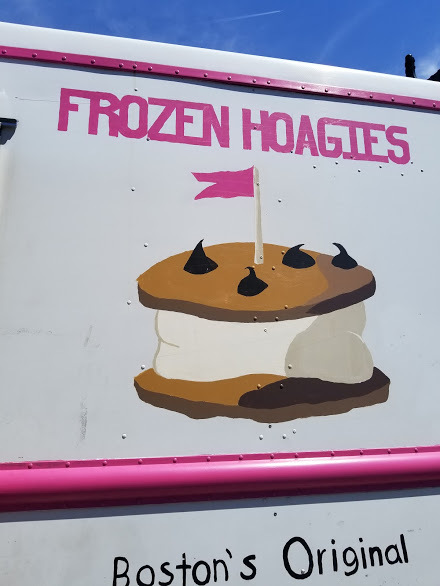 I had my eye on the Frozen Hoagies truck, which had a vegan Salted Caramel ice cream. I ordered the 1/2 Hogie which was only $4 and consisted of one cookie and a scoop of ice cream of your choice. I got the vegan Salted Caramel with a Snickerdoodle cookie. The combination was good both together and on it's own. Derek had been eyeing the Whoo(pie) Wagon since the beginning of the festival. 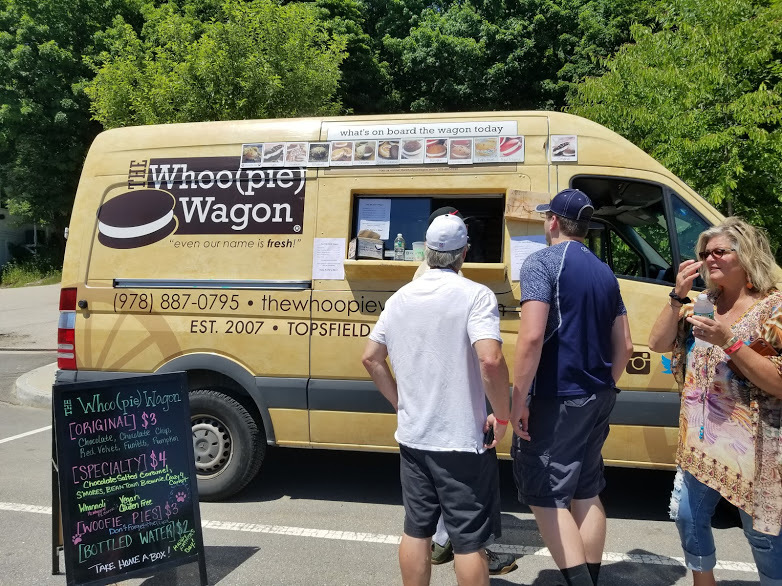 He got the Chocolate Chip Whoopie Pie which he said was delicious. He said it was nice and cold too, which he appreciated because of the heat that day. We had a great time at the festival and will definitely be back again next year. It was well organized, had a great mix of food trucks offering something of everything, and had a good mix of beer too! We cant wait for the next one! Our newest favorite summer tradition is food truck Fridays at Nashoba Valley Winery in Bolton, MA. On Fridays this summer, Nashoba is hosting rotating food trucks while also selling their delicious house made wines, beer, and liquors. 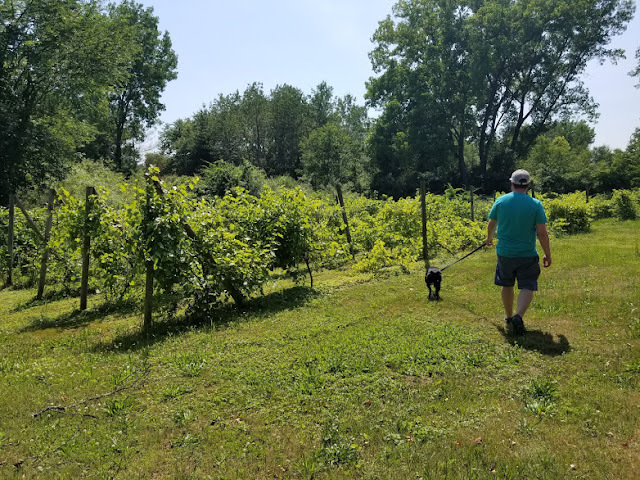 Derek and I have loved taking our pup to the winery on Fridays this summer so far. We have a great time with our friends and their pup too! 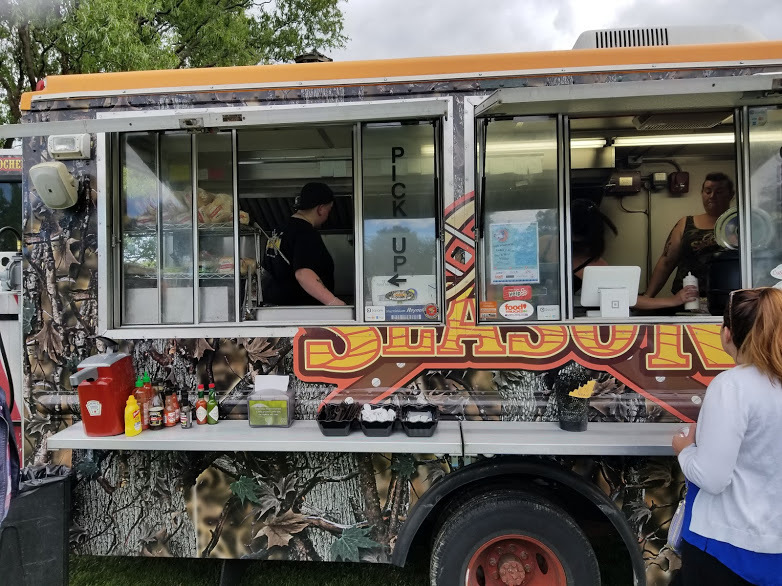 This last week, Nashoba hosted Open Season, which is a food truck specializing in wild game. 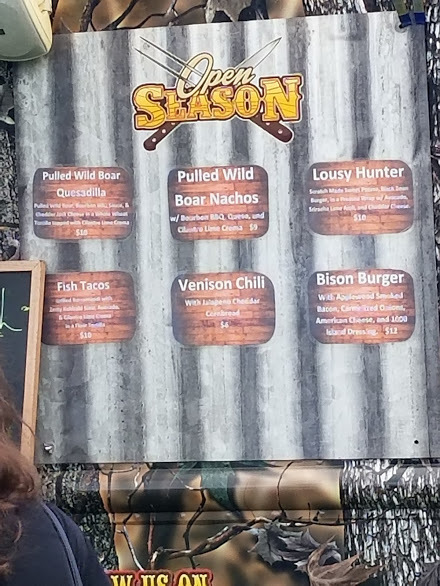 The menu imcluded items like Wild Boar Quesadillas, Venison Chili, Fish Tacos, and Buffalo Burgers. The truck was camouflage which I thought was a great touch. 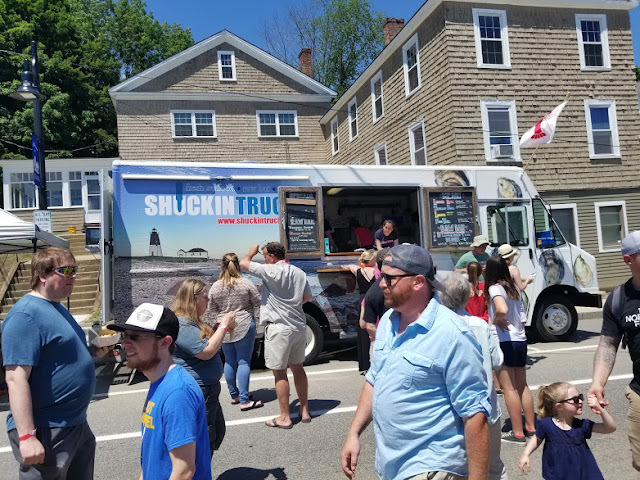 The truck is based in Providence, Rhode Island. 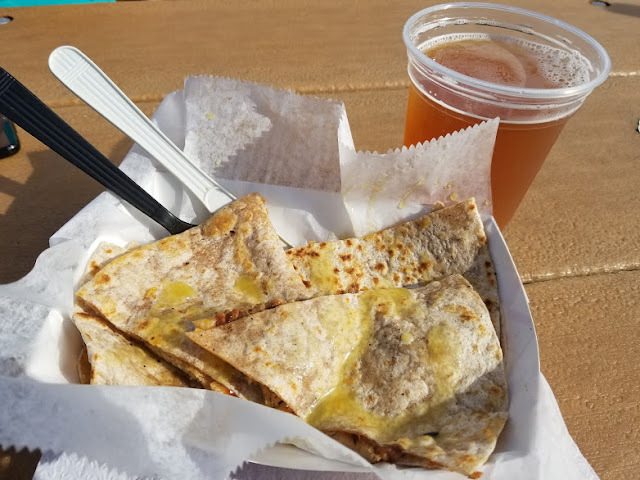 I ordered the Wild Boar Quesadilla with no crema. I have a lactose intolerance, so I can handle the cheddar jack cheese but not the crema. The Quasadilla was delicious. I hadn't had wild boar before, but the BBQ sauce made it sweet. It was a consistency of regular pulled pork but a little more sweet and succulent. It was an amazing dinner, and I highly recommend this truck! I washed it down with Nashoba's Blackberry Ale, which was crisp and thirst quenching. The blackberry taste was light and not over powering. 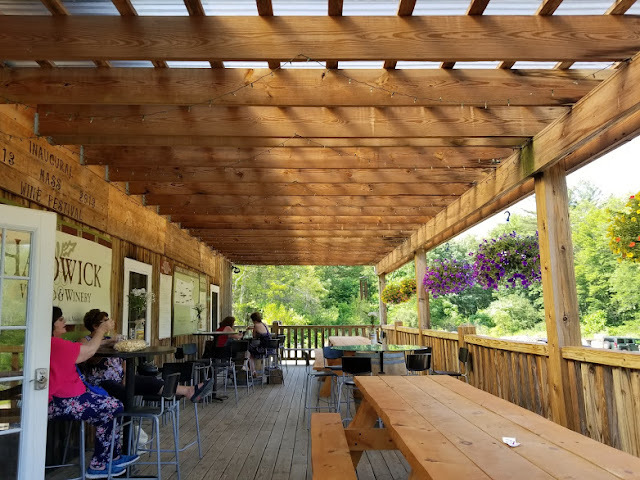 If you are on the area, definitely check out food truck Fridays at Nashoba Valley Winery from 4-7 on Fridays through the summer. On June 9th and 10th, Kalon Farms in Lancaster, MA hosted the spring Pro.Found Vintage Market. 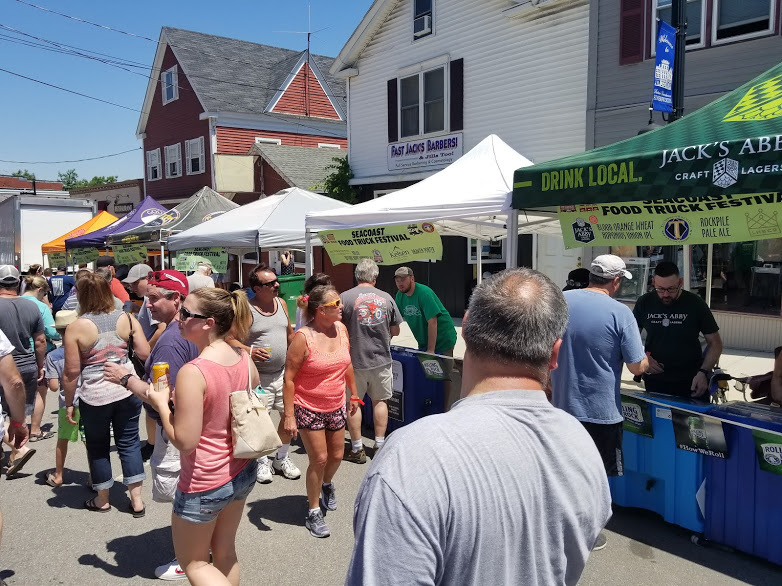 We missed last year's market, so we were pretty pumped to go this year. 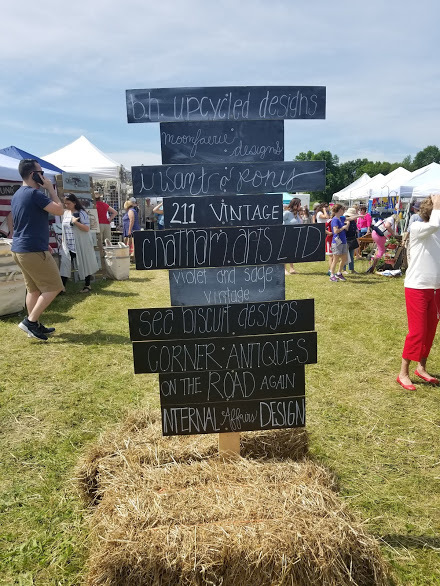 The market was made up of vintage antique booths, food trucks, and live music. There was also coffee and lemonade booths. The whole event was pretty organized. We bought our tickets ahead of time, so we were quick checked in. You could also purchase tickets the day of. 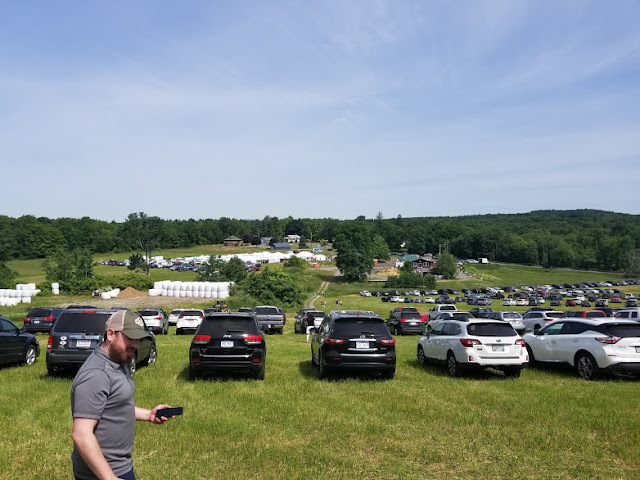 There were tons of people there, so we did have to park up on a hill in the farm. The market was quite crowded. It was pretty easy to move throughout the market, but the individual booths were packed because there were so many great antiques. There was a good mix of raw antiques vs upcycled antiques. 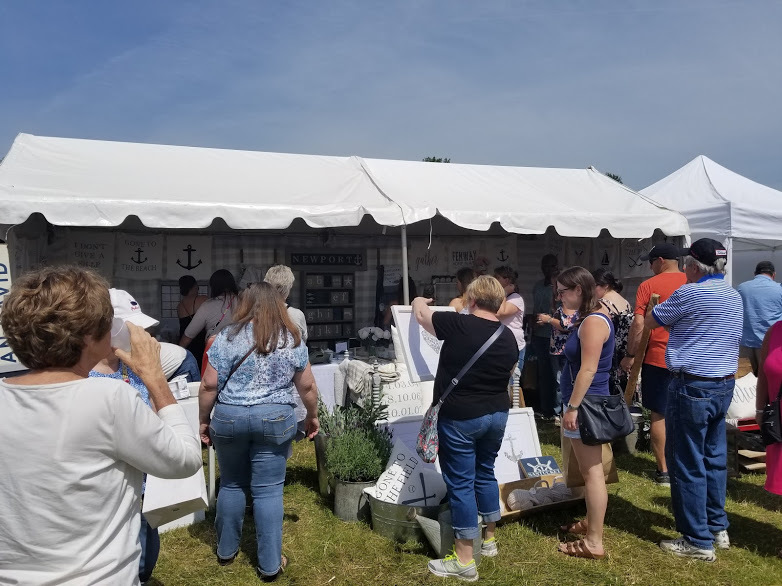 There were also some vendors selling handmade items like candles, clothing and soap. The prices were pretty reasonable, and we didn't really see anyone asking for crazy prices. There was also a good mix of food trucks and drink booths. Derek waited in line for lemonade which was perfect for the hot day that it was. 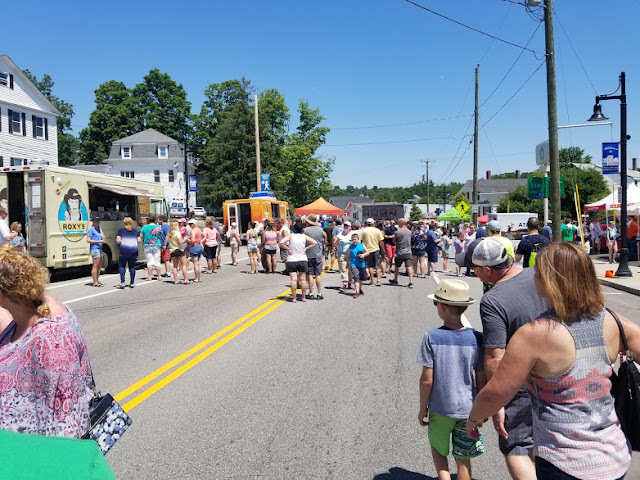 The lemonade booth had a huge line due to the high demand. 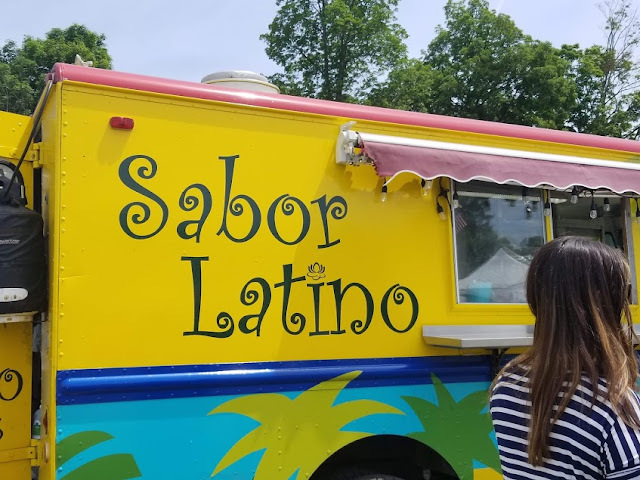 We also got lunch from one of the food trucks, Sabor Latino. I went to the truck right as it opened so I only had to wait 10 minutes from getting in line to food in hand. I ordered the Cuban sandwich with fries. The sandwich was massive, and I couldn't eat it all. Is was delicious though. Derek had the fries, which were some of my favorite food truck fries. We went to the market hoping to find an island for our kitchen, but they didn't have any. There were only a couple booths selling large furniture. He did leave with a bucket made of an old artillery shell that we are going to use as a flower pot, and a wall ruler. Both items together cost less than $50 at the same booth. We enjoyed the market and will definitely be back in the fall! The market will run September 22nd and 23rd. We definitely recommend it for a fun day outside that the whole family can enjoy.